Once a month (usually on the 1st), I like to post a short summary of our financial and personal situation for the previous month. Welcome to June. Did everyone have a good May? It’s been a stressful month for us. Out of the blue, our dog Abby became very sick. She suddenly began to urinate frequently and have blood in her urine. We took Abby to the vet and she was diagnosed with a urinary tract infection (UTI) and placed on 2 weeks worth of antibiotics. After her initial infection cleared up, Abby developed another UTI around 2 weeks later. We decided to visit a new veterinarian to seek a second opinion. Our new vet ran a urine culture test to determine the type of bacteria that was causing Abby’s infection. Our vet also performed an ultrasound and discovered that Abby had some large stones in her bladder. 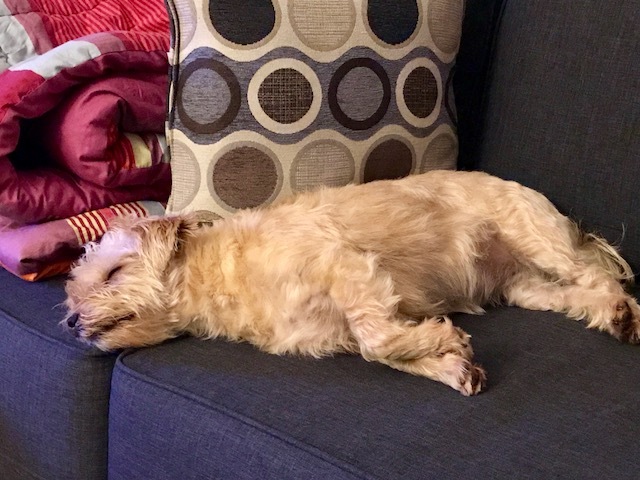 Abby’s chronic infection led to the development of urinary crystals, which eventually formed bladder stones. The urine culture determined that Abby had a rare type of bacterial infection caused by Methicillin Resistant Staphylococcus Pseudintermedius (MRSP). This nasty bug has resistance to many commonly used veterinary antibiotics. To treat this infection, Abby was prescribed a medication called chloramphenicol. This antibiotic is an older type that is no longer used in humans due to its toxicity and high risks of developing nasty side effects such as bone marrow suppression, leukemia, and even death. When administering the medication capsules to Abby, we were advised to handle it with gloves and to avoid inhaling the medication if the capsule broke. Abby’s medication caused her to be constipated, vomit frequently and lose her appetite. Because of the toxic effects of the chloramphenicol, our vet recommended a short duration of medication treatment. Our vet also recommended that the bladder stones be removed by a surgical procedure called a cystotomy. 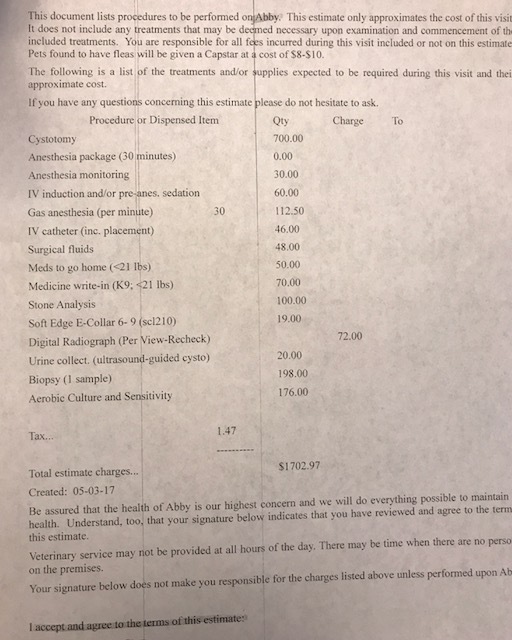 The costs of all of Abby’s testing and medication came out to be $665.50. The estimate of Abby’s cystotomy surgery was estimated to be $1702.97! Even though this was a large amount of money, we were prepared to spend it in order for our dog to get the care that she needed. We felt lucky to be in a position where we didn’t have to worry about the financial aspect of treating our dog. Abby is a part of our family. The day before Abby was scheduled to have her operation, our vet ran an X-ray and ultrasound of Abby’s bladder. By some miracle, Abby managed to pass her stones! The vet was very surprised and mentioned that this rarely occurs. The surgery was cancelled last minute. We were so relieved – the whole ordeal was such an emotional rollercoaster. The rest of the month was great. Our son is growing up so fast, he'll be 2 years old next month! We try to enjoy all the moments we have together. We took our son back to the Discovery Cube. Since we have a 2 year season pass, we can visit anytime. I went to a friend’s wedding. We had a few dinners with close friends. We spent Memorial Day with a BBQ at our friend’s house. 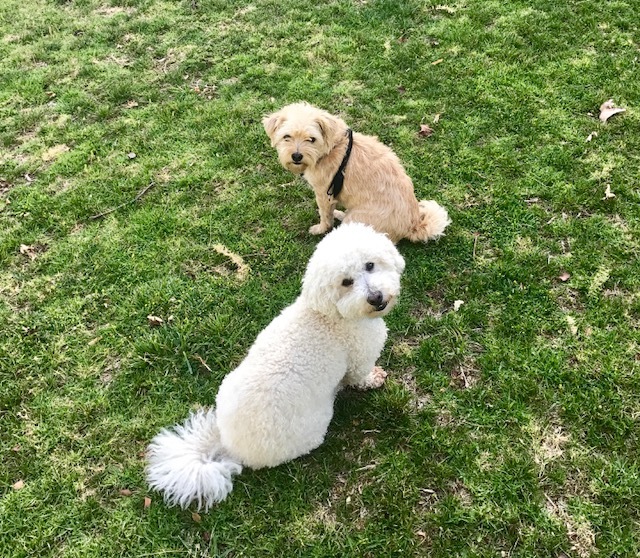 Our big worry for last month was the well being of our dog. 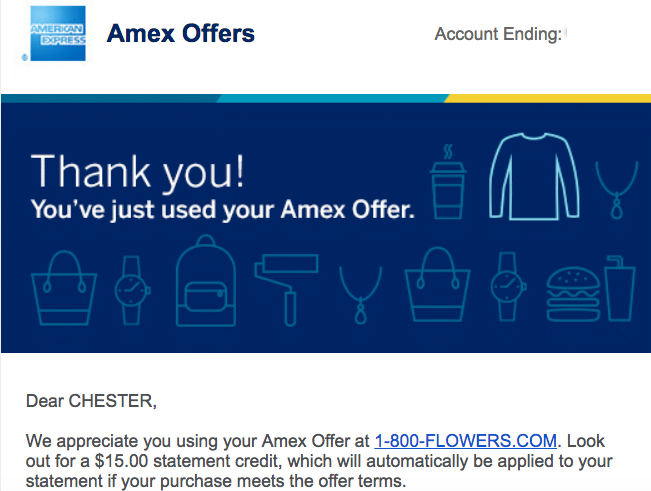 On 5.14, I received a $15 statement credit on my AMEX Premier Rewards Gold card from AMEX Offers (spend $50 at 1800Flowers.com and get $15 statement credit). I also made the purchase through the United MileagePlus Shopping Portal to earn 30 United miles per $1 spent. On 5.1, I received a check for $162.50 for teaching at the local university. On 5.25, I received a check for $325 for teaching at the local university. On 5.4, we received a net profit of $430 from our rental property. All of this totals $947.50 from our side hustles for the month of May. Not a bad month. This side income really helped to offset all of our dog's medical costs.